Kind-hearted Estonian workers rushed to rescue a dog in distress from a freezing river on Wednesday - unaware of the fact they were actually about to bundle a wild wolf into their car. The men were working on the Sindi dam on the Parnu river when they spotted the animal trapped in the icy water. After clearing a path through the ice, they took the frozen canine to a clinic for medical care. Only then was it revealed they had been carrying a wolf. 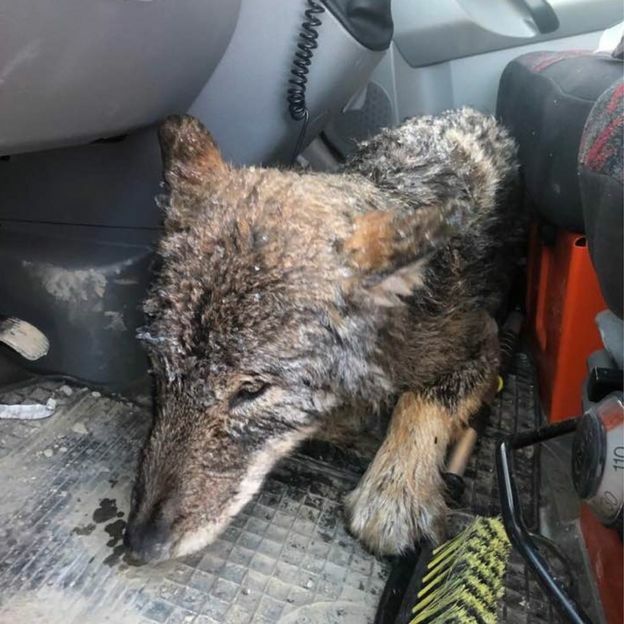 The Estonian Union for the Protection of Animals (EUPA) said the wolf had low blood pressure when it arrived at the veterinarian's office, which may have explained its docile nature after the men carried it to their car to warm it up. The wolf recovered from its brush with death within the day and, after being fitted with a GPS collar by researchers from the national environmental agency, was released back into the wild. "We are so happy for the outcome of the story, and wish to thank all the participants – especially these men who rescued the wolf and the doctors of the clinic who were not afraid to treat and nurture the wild animal," EUPA said. Estonia is home to hundreds of wolves, only a handful of which have been collared in recent years. As a species, they usually avoid humans. It was picked as Estonia's national animal last year by a group of nature organisations. Dogs > Humans. 12/10, would save again. Speaking to the Estonian newspaper Postimees, one of the men, Rando Kartsepp, said: "We had to carry him over the slope. He weighed a fair bit." "He was calm, slept on my legs. When I wanted to stretch them, he raised his head for a moment," he added. Veterinarians had some suspicions over the large dog's true nature, but it was a local hunter, familiar with the region's wolves, who finally confirmed it for what it was: a young male wolf, about a year old. I would hope so...he looks chilly indeed. Wolves are suprisingly huge compared to dogs. It's suprising that they didn't notice it before. Wolves have bigger heads normally and long legs in comparison to their body size. But the average person, in those circumstances, would struggle to distinguish between a wolf, Husky, Malamute and even German Shepherd. Give those blokes a bells. Lots in the Garden Route Wolf Sanctuary. People think “Aaaaw cute” and get one, only to realize it was a bad idea. Then the sanctuary have to care for them. Not being nasty towards your comment, just saying. I had an “Aaaw cute” moment with a Husky. First 4 years was hell, but I was committed to the end, which was at the age of 12. Some people just cant do that, and then the animals end up in sanctuaries. But yes, theoretically I would also like one. Boet, I live in a farm.